Last year’s upgrade to a full fledged UCI race (which is rare) deepened the field and this year looks to be even better. One thing I’m starting to accept is the irregularities in a seven stage race. The favorites aren’t as much of favorites here because mistakes and risks are far more amplified in one week of racing rather than in the grand tours where you go for three. Maybe the best rider doesn’t always win, but the best racer of the week deserves to be on the top step. While the Giro d’Italia will already be a week deep once the TOC starts it’s easy to state why this race may be the more exciting of the two. Big Kahuna Award: The queen stage comes early this year which seems disappointing in terms of captivating a week’s worth of drama. The first inclusion of Gibraltar brought a lot of drama as Team Cannondale led a thin, select group up it’s slopes eventually ceding control to a bursting Julian Allaphillipe taking the win and taking home the yellow jersey. Since all the GC candidates should be in play with a lot more firepower at their hands, don’t be surprised if the UCI teams just look at each other when someone from the continental ranks takes off. My prediction: victory favors the bold. Let’s hope Stage 2 up Gibraltar matches the fireworks from two years ago. Starpower Award: Every year the field of sprinters at the TOC awes me and then gets even better! Just to have 3x World Champion and supreme entertainer Peter Sagan would be enough for most races. Then you have Marcel Kittel who is probably the most dominant pure sprinter out there. Mark Cavenish is back and healthy (probably temporarily) who had the most ATOC stage wins until recently overtaken by Sagan. Fernando Gaviria who took the points competition in the Giro last year is instead coming to Cali to mix things up. Throw in next-gener Caleb Ewen and the wily Alexander Kristoff and there’s not enough stage wins to go around for the sprinters. This is really everyone who is everyone who makes their living at this! Biggest Disappointment: Every year I wish the women’s race would be on equal footing as the men, but this year’s race took a step back going from four stages to three. I take pride in our state being ahead of the curve in many things, but in terms of …. we’re just not there. I’m also mad that once again the women’s race doesn’t came down to Southern California. My daughter and I were watching a Kings game and I asked if she wanted to try hockey. Her response, “it’s only for boys”. That doesn’t make me feel good. Mr. Insignificant Award: This goes to my pick for the King of the Mountains jersey. Every year it seems to be some guy and once again I’m picking him as the favorite. Some guy always comes through. Peter, Bjorn & John Award: If you don’t care about the old folks, then this is the race for you. 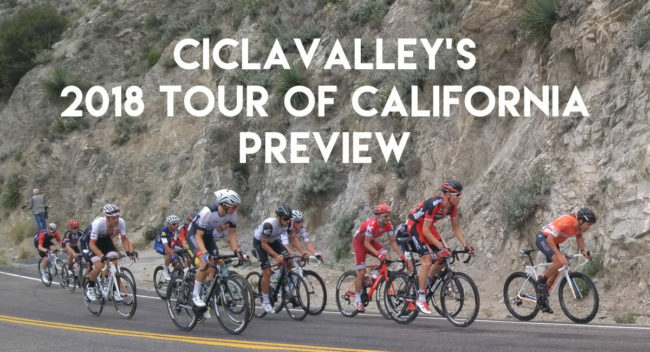 CiclaValley is overjoyed that the Hagens Berman Axeon team was selected to race after a one year hiatus. Although this is a developmental team, their stock of riders always come to race threatening the dynamics with unwonted attacks that rattle the big boys. Logan Owen is a recent graduate from the team that’ll be suiting up, but keep an eye out for his former teammate Neilson Powless who put a lot of pressure on the contenders up Gibraltar in 2016 as a 19 year old. Americans Taylor Eisenhart from Holowesko – Citadel also has been showing great promise as a 23 year old and will probably land on a pro tour team next year. 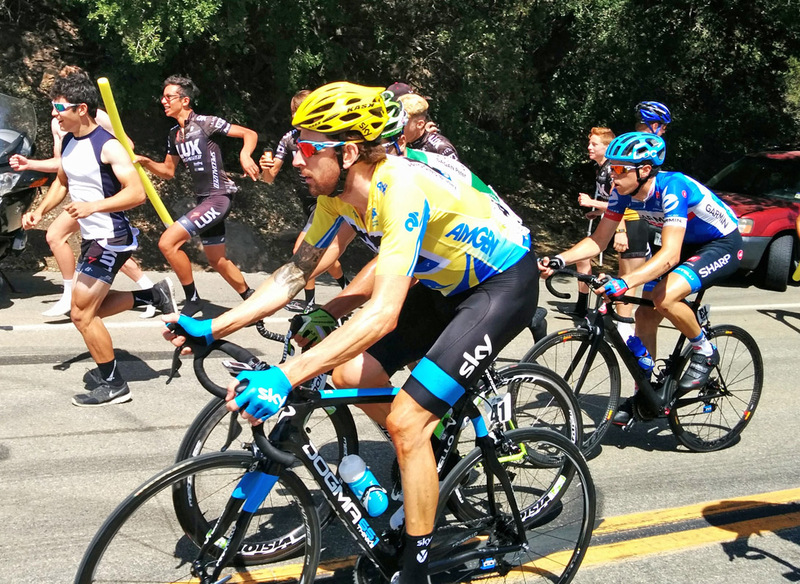 Grand tour contenders do come to California, like TDF winner Bradley Wiggins and Rohan Dennis. The Downsizing Award: Last year, the TOC shrunk from eight stages to seven. Not cool. This year, the race is also shrinking by those exact numbers, but this time for riders per team. While I’m about more the merrier, I’m pretty interested to see how this plays out. One less teammate thins out the possibility of chasing breakaway moves down. This may hurt the favorites, but we should see more racing in its place. David Zabriske Award: Susan Lucci was nominated 19 times for an Emmy before winning one. Zabriske was runner up in the TOC four times and never won, so this award goes to the other contenders. One thing that is guaranteed is that George Bennett will not repeat since he’s doing the Vuelta. Rafal Makja was the lead contender last year (finishing second), but this year we’re still now quite sure what form he’s in. There’s also a good field of riders that are half a step behind the top contenders would normally be at the forefront in other years. Expect Adam Yates, Ian Boswell, Lachlan Morton and Lawson Craddock to be in the mix when the field thins down on the climbs. Stage 3 is relatively flat, with a few of busters at the end. The Yawn-ni Award: All the odd numbered stages are mainly flat meaning there will be some early breakaway that gets caught with a few miles to go resulting in a sprint finish. Like an NBA game, you can probably get away with watching the last two minutes to see the good stuff. The main hope to break this up are some good crosswinds which can easy catch teams falling asleep as the peloton splits. The main exception is Stage 3 filled with a mixture of Cat 2 & 3 climbs including a ten-percenter two miles from the finish. Peter Sagan might wrap up the green jersey with a strong move here. Awkward High School Reunion Award: When he last raced here five years ago, Tejay van Garderen was anointed “most likely to succeed” after comfortably winning the TOC and a fifth place finish at Le Tour the year before. While 2014 had some good results, his form since then has been all over the place questioning if he belonged on the top ring of contenders. At 29 years old, you can’t write him out, but the clock is ticking on this Great American Hope. A strong showing here can be start down the road of redemption. Tejay winning in 2013…the last year they handed out babies as prizes. The Tour of California & _________ Award: goes to Stage 6 as the race goes outside of our state’s border and into Nevada briefly before finishing back in state. This will likely be the final opportunity for a GC shape up unless there’s a narrow time gap at the top like in 2015. 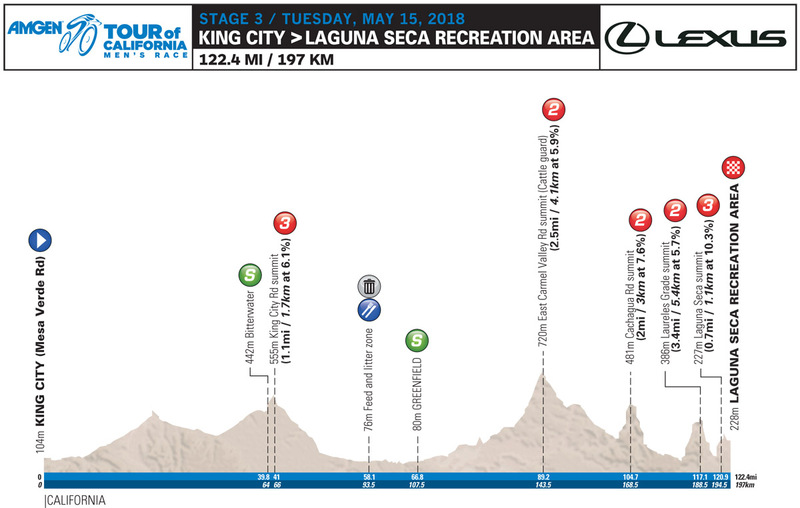 The stage has six categorized climbs, but the race will likely shake out on the penultimate one as they’ll climb 7.8 miles at 6% likely isolating the climbers. They finish up with a Cat 3 climb at the finish which will be interesting because someone tends to go too early at this point ruffling the tactics. Make sure to tune in on Friday. Catch a Rising Star Award: The last two winners of the TOC, Julian Allaphillipe and George Bennett, were riders in their 20’s on their upward trajectory (not to mention Sagan the year before, but was already a star). My pick to take the leap is Team Sky’s Egan Bernal and YIKES what a ceiling he has. With 2018 being his first season on the top circuit, he’s finished 6th, 1st, Did Not Finish and 2nd in his pro tour races. And he was in 2nd place at the Volta when he crashed out on the final stage. By the way, he’s 21! You’re not supposed to be competing at this level yet! He’s so new, other teams may not be used to his moves giving Bernal a huge advantage taking it all. Expect fellow countryman Daniel Martinez from EF Education to be right up there with Bernal also putting up impressive results at the old age of 22.